Wine Recommendations for August 2011; It's All About California! Wine recommendations for August 2011 focus on California wines. 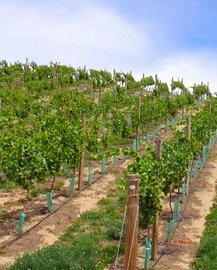 California wines a wonderful, but prices have gone up in recent years. It isn't always easy to find great values. But we have ten wines that are worth your time. these wines are sure to be great hits at your summer barbecues. Cheers to summer and to California. Or perhaps to summer IN California! Beringer Sauvignon Blanc Napa Valley 2009. Notes of apple, citrus, and pineapple. Tangy and refreshing. Score of 89, $16.00 USD. California. Bonterra Chardonnay Mendocino County 2009. I recently tried this wine at a Farm to Table event at Suzie's Farm in San Diego. Maybe it was the venue, but I really think it was the wine! Lovely notes of apple, melon, and honeysuckle. Score of 87, $14.00 USD. California. Estancia Chardonnay Monterey County. Tangy notes of peaches and citrus. Rich and firm. Score of 87, $12.00 USD. California. Roth Sauvignon Blanc Alexander Valley 2010. Notes of apple and citrus. Spicy and crisp. Score of 89, $16.00 USD. California. Pedroncelly Zinfandel Dry Creek Valley Mother Clone 2008. Notes of hers, cherry, and a bit of licorice. Perfect for those barbecued ribs! Or just because! Score of 88, $15.00 USD. California. Kenwood Pinot Noir Russian River Valley 2009 Notes of berries, herbs, and minerals. Score of 87, $16.00 USD. California. Brazin Zinfandel Lodi Old Vine 2008. Spicy, Smokey notes of cherry and plumb. Score of 87, $16.00 USD. California. Bonny Doon Vin Gris de Cigare Central Coast 2009 Fruity notes of strawberry, minerals, and spice. Dark rosé? Light red? Call it what you will, it is delicious. Score of 88, $15.00 USD. California. Wine Recommendations for August 2011 Pay Homage to California!